With a look of concentration on her face, a worker guides the sheet of denim through the sewing machine, and a pair of jeans starts to take shape. As the needle goes up and down in a blur of movement and rattling noise, a line of stitching starts to form a neat trouser leg. When most people think about the global fashion industry it is safe to say that a sleepy town in far west Wales does not immediately spring to mind. Yet Cardigan, on Wales' Irish Sea coast, has for the past five years been home to a high-end jeans-maker - the Hiut Denim Company. Beloved by a growing number of fashionistas from New York to Paris, and London to Melbourne, Hiut ships its expensive jeans around the world. As orders arrive via its website, Hiut's workforce of just 15 people gets to work hand-cutting and sewing the trousers from giant rolls of indigo-coloured denim that the company imports from Turkey and Japan. Despite only making around 120 pairs of jeans a week, founder and owner David Hieatt has big ambitions to expand. While it may seem a little incongruous that a posh jeans business is based in west Wales, Cardigan (population 4,000) actually has a long history of jeans-making. For almost 40 years the town was home to a factory that made 35,000 pairs of jeans each week for UK retailer Marks & Spencer. But in 2002 the facility closed with the loss of 400 jobs when production was moved to Morocco to cut costs. Fast forward 10 years, and when Mr Hieatt - a proud Welshman - was looking to open a factory to start making jeans, he chose Cardigan. The company name is a combination of the first two letters of Mr Hieatt's surname and the word "utility". "Where better to locate ourselves than in a town with a history of jeans-making, where the expertise remains?" he says. 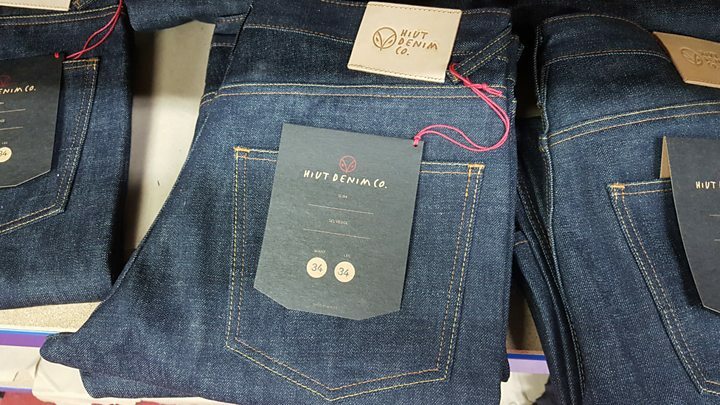 Employing machinists who had previously worked in the old factory and not lost their years of jeans-making skills, Mr Hieatt says he was confident that Hiut could be successful if it concentrated on selling directly to consumers around the world via its website. "Without the internet we'd have been dead within 12 weeks," he says. "But the internet has changed only everything. The internet allows us to sell direct and keep the [profit] margin... it enables us to compete." Now exporting 25% of its jeans, it takes Hiut about one hour and 10 minutes to make one pair, compared with 11 minutes at a highly mechanised jeans industry giant. And rather than staff doing just one part of the manufacturing process, such as sewing on the pockets, each machinist at Hiut makes a pair of jeans from start to finish. Mr Hieatt refers to the workers as "grand masters". This is in reference to the fact that some of them have more than 40 years of jeans-making experience, and new joiners have to train for three years before they can start making jeans for customers. In running Hiut Mr Hieatt and his co-owner, wife Clare, have benefited from their experience of previously owning a clothing firm called Howies, which they sold to US firm Timberland for £3.2m in 2011. But what has also been invaluable is Mr Hieatt's previous career working in advertising. This advertising nous has enabled him to very effectively market and promote Hiut, from its snazzy website, to its extensive use of social media; both adverts in people's Facebook feeds and arty photos of people wearing its jeans. "The interesting thing about social media for me is that up until Facebook, Instagram, Twitter and SnapChat you had to have a huge budget in order to tell your story," he says. "In effect you were locked out of telling that story because the costs [of advertising and wider marketing] were too high. But social media has actually allowed the smaller maker [small firms that manufacture things] to go and tell his story. This is the ninth story in a series called Connected Commerce, which every week highlights companies around the world that are successfully exporting, and trading beyond their home market. "And actually, if David wants to beat Goliath, the best tool in the world is social media." Mr Hieatt also sends out free jeans to what he calls "influencers", either fashion bloggers or famous people, in the hope that they will write or talk positively about the brand. Successful examples of this have been an increase in orders from Denmark after Hiut sent a pair of its jeans to celebrated Danish chef Rene Redzepi, and also UK TV presenter Anthony McPartlin of the duo Ant & Dec tweeting about the company. As Hiut continues to win overseas orders for its jeans costing up to £230 ($300) a pair, Mr Hieatt admits that one negative issue the company has to deal with is a return rate of "about 14%" - people sending them back because they don't fit. To counter this problem Hiut is exploring using technology that can accurately tell from a photo a person's perfect jeans size. Dr Natascha Radclyffe-Thomas, fashion marketing course leader at London College of Fashion, says that if Hiut wants to expand its overseas sales it needs to "have the website in different languages" and consider partnerships that will see its jeans listed on other websites. Back at Hiut's small factory on the edge of Cardigan, Mr Hieatt says the long-term aim remains to recreate 400 jeans-making jobs in the town. "Our aim is to get 400 people their jobs back. If you ask me when is that going to happen, the honest answer is I don't know. "But I believe in compound interest. Small things over time gather huge numbers."